You can commission jewellery from Diane. She delights in creating special, unique pieces for clients, and enjoys collaborating with clients to create bespoke pieces. Commissioning a piece of jewellery need not be expensive. Diane will work with you within your budget to come up with a piece of jewellery especially for you. 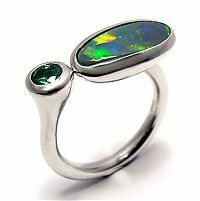 Diane is happy to work on a broad range of commissions, whether it be a piece in sterling silver priced from $200 or a piece in gold set with gemstones. The price structure is dictated by a combination of the materials chosen, the techniques used and the detailing incorporated. Diane is happy to work with stones and other materials belonging to clients, bringing to life unworn jewellery. She often works with inherited pieces, incorporating their elements into a design for a new piece of jewellery without losing their sentimentality. Liz inherited the original ring from her grandmother, and was keen to have the diamonds incorporated into a more contemporary ring she could wear every day. Sandy had a collection of gold jewellery she no longer wore, and was keen to have it melted down and incorporated into a new piece of jewellery. The occasion of a wedding is a perfect opportunity to have a personally designed ring created, reflecting the significance of the event. Marine life of the Great Barrier Reef provided inspiration for this playful collection.